Director – Lee Unkrich, Screenplay – Michael Arndt, Story – John Lasseter, Andrew Stanton & Lee Unkrich, Producer – Darla K. Anderson, Music – Randy Newman, Animation Supervisors – Bobby Podesta & Mike Venturini. Production Company – Pixar Animation Studio/Disney. Andy is now seventeen and about to go to college. Woody, Buzz and the toys lament that he no longer plays with them. Andy’s mother persuades him to clean up his room before he goes, to throw out what he does not want and store the rest in the attic. Andy puts all the toys except Woody into a trash bag to go in the attic but this is accidentally thrown out. Dismayed, the toys elect to jump in a box where they will be donated to the Sunnyside Daycare Centre. Woody implores them that they all belong to Andy but they decide to go, believing this means that Andy no longer wants them. They are welcomed by Lots-O’Huggin Bear who tells them that the daycare centre is a paradise where children always play with them. However, the toys soon find that this is a nightmare as they are locked in a room with the pre-schoolers who batter, mutilate and abuse them in a frenzy. As they try to survive this, they realize that Lots-O’Huggin Bear has created a cruel totalitarian society that allows him and others a position of privilege with the older children. However, this require a regular input of new toys to be battered and abused by the younger ones – and that the only fate that awaits them is the trash bin. 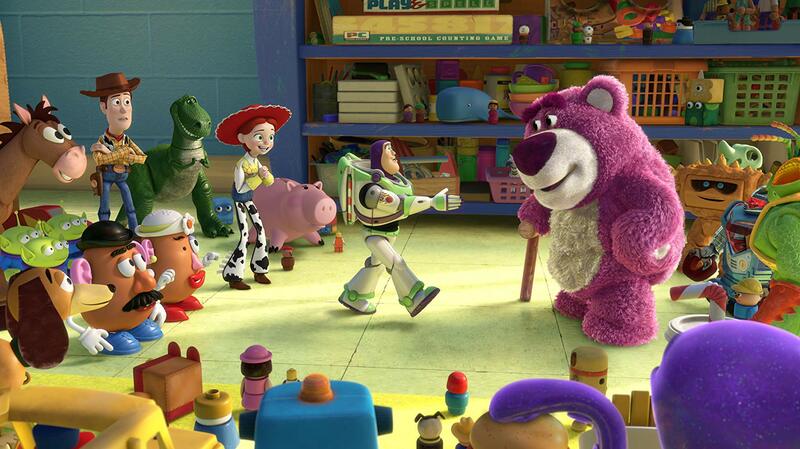 Toy Story (1995) was the flagship that announced Pixar’s presence to the world. Fifteen years later and Pixar has become the No 1 name in mainstream animation and continue to produce a string of hits that have never failed once either in terms of critical and audience reception or box-office popularity. These include the likes of A Bug’s Life (1998), Monsters, Inc. (2001), Finding Nemo (2003), The Incredibles (2004), Cars (2006), Ratatouille (2007), Wall-E (2008), Up (2009), Brave (2012), The Good Dinosaur (2015), Inside Out (2015) and Coco (2017), as well as sequels to many of these. 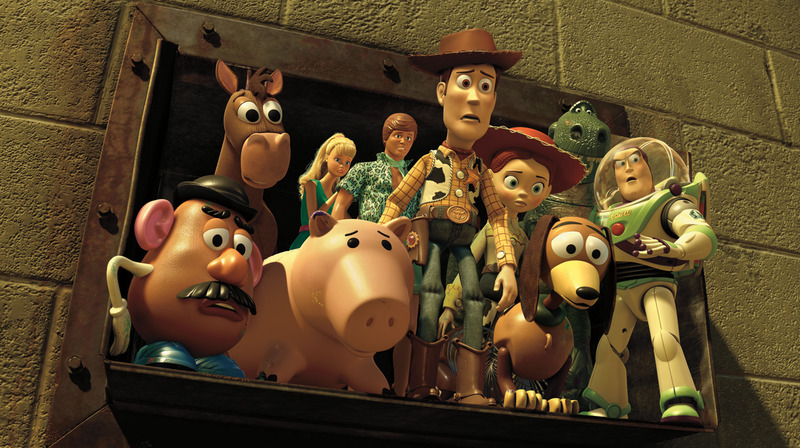 Pixar already sequelized Toy Story once with Toy Story 2 (1999), which succeeded in hitting the mark just as well as the first film. I seem to remember an interview with Pixar CEO and Toy Story director John Lasseter at the time that said he was not interested in pursuing a Toy Story 3. Famous last words. During Pixar’s thorny negotiations with Disney during 2004-6, which was all about copyright and control of characters they had created, Disney wilfully inflamed the situation by announcing the making of a Pixar-less Toy Story 3. The matter was subsequently settled with John Lasseter ascending to become the Chief Creative Officer at Disney. There Lasseter has been instrumental in turning around the studio’s direction from its slump in the early 00s. There is a certain irony to this in that one of the first things that Lasseter did when he assumed the seat was to put an end to the studio’s cynical process of spinning out cheaply made DVD-released sequels to their animated hits – see the likes of The Return of Jafar (1994), Lady and the Tramp II: Scamp’s Adventure (2001), Return to Never Land (2002), The Jungle Book 2 (2003), Bambi II (2006) etc. The irony about this is that as soon as he curtailed this process, one of the first things that Pixar did was release an animated sequel to one of their most popular films. In fact, the subsequent Pixar slate became almost completely filled with sequels, including the likes of Cars 2 (2011), Monsters University (2013), Finding Dory (2016), Cars 3 (2017) and Incredibles 2 (2018). In order for this not to seem like a double standard, this places a huge onus on Toy Story 3 to have to stand up to its predecessors, lest it be seen as yet another cynically motivated Disney animated sequel. The massive challenge that Pixar face in making Toy Story 3 is to create something that still has the originality and integrity that goes into all Pixar films. For an example of how badly and soullessly Toy Story 3 could have emerged, look no further than Shrek Forever After (2010) released three weeks earlier. The problem is also that the series’ basic premise of the secret life of toys is limited in story options. The idea of toys that idolise their master is not something bursting with endless possibilities, especially in that the films show their human hero getting older and outgrowing playing with his toys. All of that said, Toy Story 3 does manage to wring some new and original things out of the premise and takes the series in different directions. For a certain amount of the way into the film, I sat there thinking that all it seemed to be doing was bringing the familiar characters on – and by now with two films behind them, this has become quite an ensemble – and giving each of them a piece that plays to their familiar comedic quirks. Some of the film touches familiar territory – sections where the toys are separated and must go on an epic journey into the big outside world; Woody trying to assert his authority and get the others to believe him; the three-eyed aliens that seem to do nothing other than worship The Claw; a big dramatic climactic number racing to save the toys from irretrievable separation/destruction. Here Toy Story 3 seems to be playing the safe and easy route in this respect. However, we then come to the ingenious concept of the daycare centre. When introduced, it initially seems to be a toy vision of Utopia and there is a cleverness to its glowing depiction of a world where toys can be perpetually played with and not forgotten. We see then this subverted into a totalitarian nightmare – certainly, the darkest that the Toy Story series has gotten so far – with toy trucks ominously prowling the hallways and the wonderfully sinister and demented character of a cymbal-clapping monkey who monitors the security cameras. The film also introduces the first toy villain into the Toy Story series – a genial and wisely teddy bear that “smells of strawberries” whose love for its owner has gone bad – where the role is given a superb voicing job by Ned Beatty. The film also allows its characters to mature and the end of the film where Andy finally departs for college and introduces the toys to a new home is tearfully heart-rendering (something that Pixar have developed to an artform in the last couple of years). It is a beautiful way for the Toy Story series to go out. In between the big story/character arcs, Toy Story 3 does the humour scenes with all the customary witty and clever Pixar flourishes. There are some immensely enjoyable pieces with Barbie finally encountering Ken who romances her with the corniest lines while we see him in his outfitted glory, albeit resenting being regarded as a feminised accessory; Mr Potato Head’s banishing to the sandpit and attempting to create a new body for his parts using a tortilla; even Barbie’s surprise quoting of Jeffersonian principles; and of course the activation of the Spanish-language function for Buzz Lightyear and his transformation into a Latin lothario. As with the other two films, everything builds to a big dramatic climax with a great sense of moment and proves surprisingly more satisfying than one would have thought. Pixar have announced a further Toy Story 4 (2019).